Rogue Amoeba developer Quentin Carnicelli, who works on Mac software like Airfoil, Audio Highjack, Loopback, and Fission, this week penned a critique of Apple’s Mac lineup and the company’s recent lack of Mac updates, and that missive has been gaining some attention from Mac fans. Using MacRumors‘ own Buyer’s Guide, Carnicelli points out that it’s been more than a year since any Mac, with the exception of the iMac Pro, has been updated. It’s been 375 days, for example, since the iMac, MacBook, MacBook Pro, and MacBook Air machines were last updated, and it’s been 437 days since the Mac Pro saw the price drop Apple implemented as it works on a Mac Pro replacement. The Mac Pro has not seen a hardware update since December of 2013, more than 1600 days ago. Apple has promised its professional users that a high-end high-throughput modular Mac Pro system is in the works, but we thus far have no details on when it might see a release. 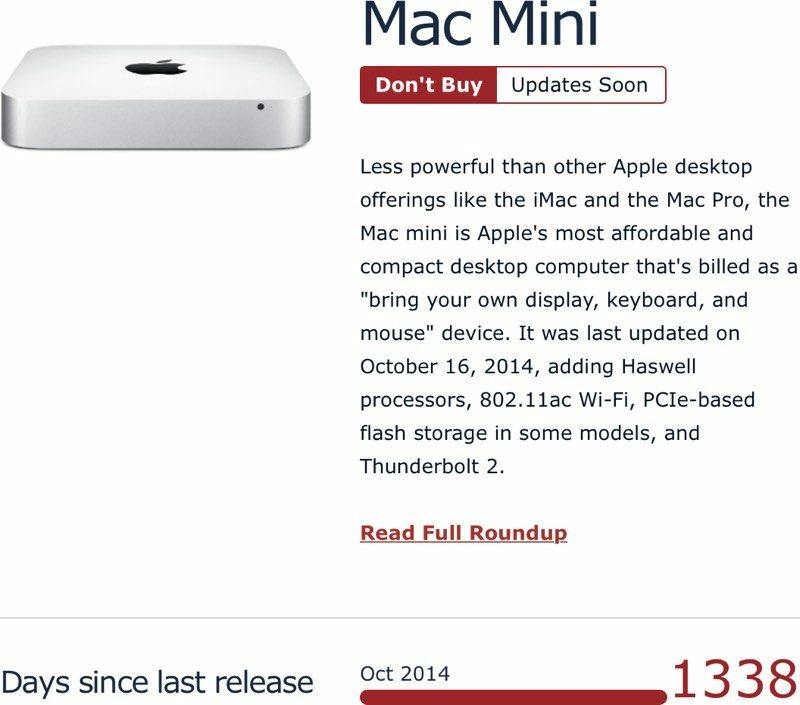 The Mac mini, Apple’s most affordable desktop Mac, has gone 1338 days without an update, with the last refresh introduced in October of 2014. While Apple has made promises about a refreshed Mac Pro, no similar statement has been provided about a future Mac mini, aside from a comment from Apple CEO Tim Cook stating that the Mac mini continues to be important to Apple. It’s very difficult to recommend much from the current crop of Macs to customers, and that’s deeply worrisome to us, as a Mac-based software company. For our own internal needs, we’ve wound up purchasing used hardware for testing, rather than opting to compromise heavily on a new machine. That isn’t good for Apple, nor is it what we want. Apple in 2017 refreshed much of its Mac lineup (iMac, MacBook Pro, MacBook Air, and MacBook) at its Worldwide Developers Conference, but this year, Apple opted to focus instead on software, with no new Mac hardware announced. With no new hardware in June, based on past release history, we could be looking at an 18-month upgrade cycle this time around, as pointed out by iMore‘s Rene Ritchie, with new Macs making an appearance in September or October. Some of the blame for Apple’s lack of updates can perhaps be placed on its reliance on Intel, and in the past, some Mac refreshes have been pushed back due to delays with Intel chips. This is likely one of the reasons why Apple is planning to transition from Intel chips to its own custom made Mac chips as early as 2020. MacBook, MacBook Pro, iMac, and MacBook Air upgrades are not in the dire state that Mac Pro and Mac mini upgrades are in, but increased attention on issues with the MacBook and MacBook Pro keyboards has left Apple customers eager to see those machine updated, especially as Apple has not acknowledged these keyboard issues despite their prevalence in the media. “Apple needs to publicly show their commitment to the full Macintosh hardware line and they need to do it now,” writes Carnicelli. The first ad spots in the series focus on photographer and disability advocate Bruce Hall, who uses his Mac for editing photographs, musician Grimes, who uses the Mac “from start to finish” to write all of her music, edit music videos, and more, and app developer Peter Kariuki who used his Mac to code the SafeMotos app, which is designed to connect passengers with safe motorcycle drivers in Rwanda. These ads, while inspiring, may be seen as too little too late by those who have grown frustrated with Apple’s Mac lineup and have come to see the lack of updates as an indicator of a lack of commitment to the Mac.